“Afghanistan: Should the Canadian mission continue to 2014?” CBC online survey says (so far), no. Here’s the report I mentioned yesterday, saying a training mission in Afghanistan would be dangerous for Canadian troops (PDF). Here’s some of what someone who’s been there, done that in Afghanistan has to say: “…. this was a rather shoddy paper, even by CCPA standards. What was remarkable about it to me was that the writers did no real research of any kind, with all their citations pointing to news articles or other similar papers. They didn’t interview a single soldier or former soldier, or anyone with any first-hand knowledge of Afghan military training in Canada or outside. (The bibliography is also bereft of any references to Afghan sources of any kind, for that matter.) I doubt I’d have said anything if they had called, but I really don’t think we’re all that hard to find. So there’s no real reason to take anything they have to say seriously ….” More from CTV.ca here and CBC.ca here. Taliban Propaganda Watch: Assassinations and attacks claimed in Kandahar, Uruzgan, and Taliban (responsible for 3/4 of civilian casualties) worries about civilian casualties. Election 2011 – Blogger Mark Collins on the Conservative and Liberal platforms on defence. Remember James Loney, the Canadian peace activist kidnapped with some others in Iraq, then rescued in 2006? He has a new book out about his experiences. “An angry soldier told a Canadian hostage in Iraq that many people risked their lives to rescue him from terrorist kidnappers, according to a new book. Captivity by Christian activist James Loney reveals how a team of Mounties, soldiers and diplomats teamed up for a joint British-Canadian operation that apparently relied heavily on the mass surveillance of cellphone signals to pinpoint the hostages and their captors ….” My own humble open source analysis of what was said in public about the rescue here (Scribd.com). Amazon.com only has the Kindle version out for now here. Added #100 to my list of Fave War Flicks here. “This year’s anniversary of the battle at Vimy Ridge is the end of an era, with no surviving First World War veterans in Canada. But 2011 also marks the beginning of a new era, with the first youth-led candlelight ceremony on the eve of the battle’s 94th anniversary. Gov. Gen. David Johnston said this event proved those soldiers who risked their lives for Canada will never be forgotten. “This is the largest youth contingent ever to observe Vimy Ridge Day in Canada. It is an honour to share this moment with you,” Johnston told a group of about 450 youth in attendance at the National War Memorial Friday evening ….” More from the Governor General’s office here. CBS News in the U.S. picks up the story of Russell Williams – video version here. Cpl. Yannick Scherrer, Royal 22e Régiment, R.I.P. 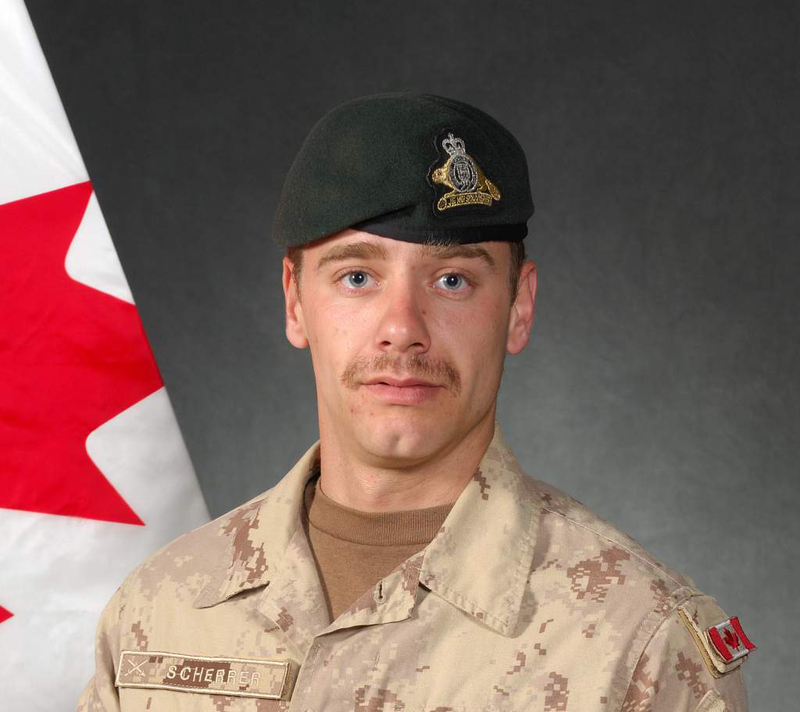 A Canadian soldier was killed when an improvised explosive device detonated during a dismounted partnered patrol in the Panjwa’i district of Kandahar Province at approximately 12 p.m. (noon) Kandahar time on Sunday, March 27, 2011. More from the Canadian Press here, Postmedia News here and the Globe & Mail here. Statements from the Governor General here, the PM here and Minister of Defence here. An Army.ca condolences thread can be read and posted to here. No Fly Zone in Libya (1) – NATO’s taking on the WHOLE Libyan job now. More from Al Jazeera English here, BBC here, Reuters here and AFP here. F-35 Tug o’ War: Ceasefire.ca wants the Joint Strike Fighter to be an election issue. Remember the Canadian in the U.S. Special Forces named last month to receive a Silver Star for bravery in Afghanistan (second last item)? He’s received it. Posted in F-35 Fracas, Military Ethos, Operation Motion/Libya, The Fallen and the Injured, What's Canada Buying? Yannick Scherrer, Royal 22e Régiment, R.I.P. Condolences to the family, colleagues and friends of the fallen. We mourn with you. No Fly Zone Libya (1) – They call it Operation Odyssey Dawn. First in: 100+ Tomahawk missiles, French ground attack planes. Who’s running the show? U.S. Africa Command for now – here’s AFRICOM’s boss’ initial word on the job..
No Fly Zone Libya (2) – Who’s who in the OP Odyssey Dawn zoo (including HMCS Charlottetown in the Med, and 6 x CF-18’s), courtesy of Reuters and the Associated Press. Taliban Propaganda Watch: Attacks, logistics convoy ambushes and assassinations claimed in Kandahar, Uruzgan and Zabul. “The Honourable Peter MacKay, Minister of National Defence, today announced plans to construct a new Integrated Personnel Support Center at Canadian Forces Base (CFB) Halifax. Located at Windsor Park, the new facility will provide a 662 m2 facility that will equip the unit with the space they require to administer the full spectrum of services they can offer …. The new facility, valued at approximately $4.2 million, will accommodate the 27 members of the Integrated Personnel Support Centre at CFB Halifax. The new facility also addresses current accessibility issues and will meet the Universal Design and Barrier Free Access Guidelines, making it more conducive to providing the services required for ill or injured personnel ….” More from the Halifax Chronicle-Herald here.